Tick-Tock, Tick – who will fix the clock? | #Hope lives! Tick-Tock, Tick – who will fix the clock? 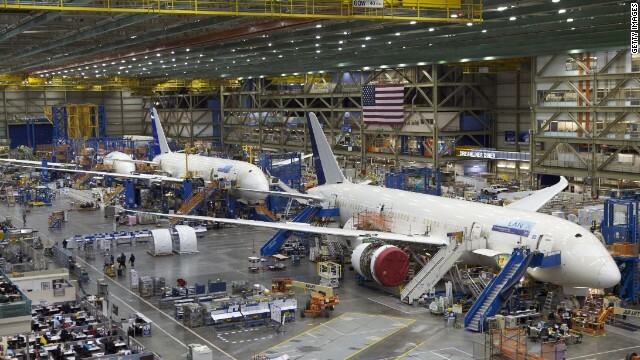 Boeings decision to build the new wide body jets 777X planes with the latest technologies in Seattle is being forced by the reality; that skilled workers like engineers and machinists, are just not available in the other states that were ready to give billions in tax breaks, to welcome them to move there. Similarly Airbus’ plans to build a new plant in Alabama, is sucking in engineers from neighboring southern states. Aircraft manufacturing is getting more sophisticated needing advanced electronics and fiber composites and new engineering and manufacturing skills. Same can be said of the automobile industry and of many other manufacturing industries that are needed for our modern world. At a time when the US manufacturing is regaining its legs and a continued expansion of the economy appears on the horizon; the retirement of the baby boomers will cause a major shortfall, of engineers and qualified personnel. A decade ago with the Y2K systems upgrades we had a similar situation; with a shortage of engineers and skilled coders for mainframes and major banking, financial, insurance and other large systems, that run most of the US computing. At that time the ramp up by what are now the IT majors in India to provide these services, helped bridge the looming gap. That problem was different as system maintenance and development does not need physical presence in the US; and can be done remotely from anywhere in the world, with the right information pipes and communication channels. You cannot build a car or an airplane remotely; and design and development has to be carried out near the actual assembly lines or plants, to ensure that they are practical and usable. While the Indian and Chinese universities are churning out millions of so called engineers they just do not have the right skill sets and need years of incubation and practical training to be able to do the jobs. In fact most Chinese engineers are not innovative enough and a majority of the so called Indian engineers are unemployable, without huge external help and training. Hopefully the setting up of research and engineering centers by giants like GE and IBM in these locations will help fill some of this gap. Robotics and automation is now extensively used to replace skilled workers; and that has led to the demise of the working middle class, as union jobs disappear, as machines take over many repetitive and mundane tasks. So while a high school graduate could previously make a good living working on the assembly lines; now advanced mathematical and science skills are needed to use the machines and systems used in modern manufacturing. The collapse of the cities and the infrastructure decay is a result of the loss of these high paying jobs, for what was at one time one of the best educated workforces in the world. Now we need more advanced degrees and sophistication and it is at a time when the engineering colleges are not producing enough graduates for our future. The brightest engineers who are graduating are being pulled into the high-tech startups and internet age companies like Apple, Google and Amazon. Manufacturers are starved of talent and left scraping the bottom of the barrel for the dredges from the great universities. The story is similar when we look across the economy at Pharmaceuticals scientists, bio-medical engineers, chemical companies, energy sector, petrochemical industries and the list goes on and on. While the US still graduates the largest number of PHDs in the world; they will not be enough to replace the baby boomers as they head off into their well-deserved retirements, sipping from tall glasses with strange little umbrellas after a round of golf or sunning themselves on a beach after a set of tennis or a jog or a swim. Instead of paying into the social safety net, they will start withdrawing social security and Medicare and Medicaid costs will continue to rise, putting a greater burden on future generations. An engineering degree at a good private university now costs close to a staggering quarter million dollars and at the same time the high schools are not graduating enough qualified graduates, who want to enter science or engineering fields. Where will the next generation of engineers come from and the case in Europe is similar to the US or may be worse as their population is aging too and not enough replacements are available. Will the great western civilization reach its peak in our lifetime and die the death of a thousand cuts as the dearth of skilled personnel bring their mighty industries to their knees. Will the ‘Atlas Shrugged’ world depicted by Ayn Rand finally come alive; as the most capable retreat into their exclusive preserves leaving the masses to their fates, with less being produced and new innovation dying? The have and the have-nots are already living in different worlds, and the trend is multiplying all across the globe. Where will the resources and leadership come to raise the standards of the masses as poverty and hunger elimination can only come from raising productive citizens, who can better contribute to society and become self-sufficient? The race is on and the clock is ticking, as we fall further behind each day while billions more are adding to our earth’s burden. This entry was posted in Economics, Technology by Rajiv Kapoor. Bookmark the permalink.